Welcome to Dickow Cyzak Tile Co.
We are the Kenosha, Wisconsin area's premier source for tile, flooring, remodeling, and decorating materials. In 2003, we became a Carpet One® store so that we could offer even more products and services to you, our clients. We know that remodeling trends come and go, but the fine materials, expert craftsmanship, and personal service we offer will never go out of style. 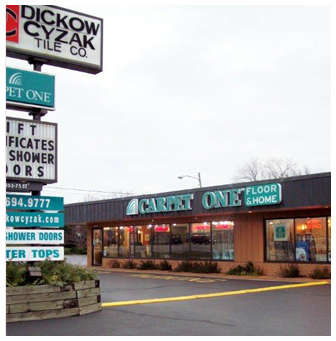 Dickow-Cyzak Tile Company has been family owned and operated since its beginning in 1968. Our next generation is actively involved in keeping our reputation intact well into the future. Hwy. 50 & Green Bay Rd.